The juicy fresh vegetables you purchase from the market take a lot of work before they are ready for your consumption. However, you can take it upon yourself to invest your time, resources and energy to grow such vegetables in your own garden.that is why we explain how to start a garden for you. This article will guide you through some of the basic steps you need to follow when coming up with a garden. Make sure to follow these guidelines and you will optimize on your garden by ensuring you get quality products as well as maximum output from it. The steps are highlighted below. Being a successful gardener involves knowing the right crops to grow in your garden. Given that you are a new gardener, you may not have a clear hint on which crops flourish better in your area. This ought not to derail your progress to start a new garden. Simply get in touch will established gardeners in your area and be sure they will guide you on the most suitable crops to work with in your new garden. In addition to letting you know the right crops to grow, they will shed light on other important factors that will make you a successful gardener. 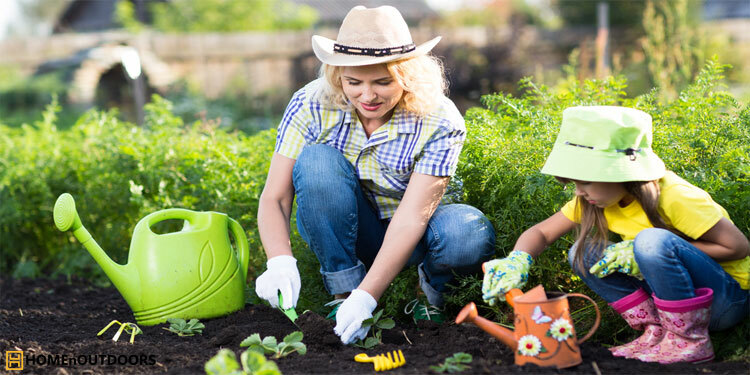 Such may include information such as the right tools to use, the most appropriate time to plant certain crops, the different ways to maintain your garden and appropriate time for harvesting your crops. Once you are enlightened with such tips, you are ready to start your garden. I recommend you plant crops that are edible at your garden. The reason for this is because people tend to spend huge sum of money purchasing food items for domestic consumption yet they can grow such crops in their gardens. Find out which crops are most consumed by your family at domestic level and prioritize them in your crops to plant list. The crops may range from fruits to vegetables. Grow such crops in your garden and you will be saving yourself huge amount of money which you drain by spending to buy such from market stalls daily. You can make addition to the edible crops in your garden and plant some flowers around the garden. These add to the beautification of your garden besides bringing insects such as bees that are very important when it comes to pollination for your crops. The location of your garden has great implication. The location will determine how well your crops get exposed to sunlight for maximum growth and for proper photosynthesis process. That notwithstanding, the location will dictate how easily you access your garden for different tasks meant to be executed to keep your garden in good shape. You will need to water your garden maybe on a daily basis thus need for a proper location. Activities such as picking and weeding also require the garden to be strategically located else it may be inconvenient for you. When dealing with crops that can easily be destroyed by pets and domestic animals such as chickens, goats, sheep or your cows, it will require you choose a location where you can control such animals to keep your crops from damage. The type of garden beds you adapt will impact heavily on your crops especially when it comes to drainage and water retention. You will notice that some garden beds look attractive than others but you ought to focus beyond the visual appeal. Some garden beds retain water and moisture better than others. Others make your work at the garden easier than others. These are some of the considerations you should be keen about when choosing the garden bed to work with. When you decide to work with raised garden beds for instance, you will notice that they look amazing by the look but they drain water very quickly thus tend to dry quicker than the sunken garden beds. The type of garden bed will also determine how effectively you water your crops. Some of the garden beds you may wish to try besides the raised beds include herbal spirals, keyhole beds, vertical beds, free form beds and sunken beds. The tools you buy to use in your garden will determine the work efficiency as well as decide whether you enjoy working in your garden. Right tools translate to better performance in your garden. Just imagine a butcher who uses a blunt knife to cut meat at the butchery; they find the task tiresome and less enjoyable as opposed to one who uses a well sharpened knife to accomplish a similar task. The most common tools that are appropriate for any gardener include the garden hoe, the scuffle hoe, hand tool, unique dethatchers, garden shovel, leaf rake, essential digital ballasts and a dirt rake. Each of these tools has its own unique task in maintaining your garden in good shape and substituting either of them for a task meant for another just makes your work in the garden more difficult. Your soil in the garden is what determines how healthy your crops will be. You thus need to carry out a soil testing activity to determine a broad range of characteristics about the soil. You need to establish whether the soil is acidic, alkaline or neutral in terms of pH. Also need to establish what type of soil it is; whether clay, sand, silts, loam or mixed soil. This affects the drainage and water retention for your crops. Established gardeners will agree with me that the best pH for most garden crops is around 7 with minute variations. Some of the properties of soil known by simply observing the soil with your bare eyes. Others require you carry out professional tests just to be certain. There are kits designing to carry out such tests with high level of accuracy. One of the tests done is the Rapid-test soil test carried out to determine pH and nutrients components in the soil. When you are not certain bout the type of soil you are dealing with in your garden, carry out the Mason Jar Soil Test and it will guide you well. You may notice that the soil in your garden is the type of soil depleted of nutrients with the first harvest of your crops. Such soil need enrich so as to remain arable and healthy to support the growth of your crops as long as you need. There are diverse ways of enriching your soil. Adding organic matter to the soil do this. The most common sources you can rely on for this include compost manure which you can simply make at home or purchase, earthworm castings, natural manure and falling leaves that form very good mulch for moisture retention. One precaution to take is with the natural manure; ensure you wait till the manure is aged else you will spread pathogens and micro-organisms to your growing crops. By enriching your soil, you will be increasing your chances of optimizing on the output and healthy crops. A great secret that I would like every new gardener to learn is that different seed variations give different output even if it is for one crop. Some seeds let’s say for pawpaw fruit will give better yield with neutral soil while different pawpaw fruit seeds may give worse results on the same neutral soil. Blinded to think that all seeds are the same and that the end results will be the same. Feel free to consult from the established gardeners or research from online sources. It is also vital to know that some seeds are seeded directly into the soil which means there is no great work involved in their preparation prior to the planting. You simply purchase them and seed them when your garden is ready for planting. This will only apply where your seeds that you intend to use on your garden seeded directly. It will require you to come up with the best seedling nursery to nurture your transplants so that the moment you transfer them to your garden, they will pick up the pace and grow to your expectations. Working with transplants is not only economically but also allows you grow the specific varieties of crops in your garden. Make sure to spray your transplants with the right pesticides so as not to interfere with the pollination cycle when they are transferred to the garden. The moment your garden is ready and you decide on the seeded to use; direct seeding or transplants, then you are ready for the actual planting. Just to put it into perspective, most seeds when being bought come with the planting guide to help you avoid common mistakes that may lead to poor yields. Planting with great care following all the rules of the thumb and those specified in the seeds’ container. Failure to observe this at times leads to your seeds remaining buried for eternity never yielding any products. Recommendation that you plant every seed 3 times in reference to the seeds’ diameter. This allows for right time to germinate and also prevent harm from excessive solar radiation. When dealing with transplants, plant them according to the depth they were growing with while in the pot. You should wait until there is no frost so as to plant seedlings that do well in heated areas or warm temperatures such as cucumbers or tomatoes. Planting the seedlings in your garden are the final step you take then say you are waiting for crops to yield. You ought to carry out several tasks for maintenance to ensure that crops are growing as anticipated. Need to monitor every stage of the crops’ growth until they are fully grown and ready for harvesting. Otherwise, you ought not to tire nor retire from caring for your crops. ​​​​The most common activities you will require to carry out include adding fertilizers to your crops especially when you notice retarded growth. The retarded growth could be as a result of poor soils or depleted soil nutrients thus need for reinforcement. Keep watering your crops to ensure sufficient moisture for growth and photosynthesis. You should ensure your crops are free of weeds which compete for nutrients with them through routine weeding. This also facilitate in aeration of the crops. Ensure you keep the garden lawn free of grass by frequently trimming any growing grass with the help of a grass shear and clear such grass using the lawn sweepers. Most people would think that harvesting is never that important but let me enlighten you there. Failure to harvest your crops on time when they are ready will lead to over-ripening and reduced quality in the crops. Some crops harder when they overgrow due to late harvesting thus altering the desired flavor and texture. Every crop has its most appropriate time for harvesting when they mature. Research has it that crops’ flavor is best when you harvest your crops after morning dew settles. In cases you are dealing with tomatoes (which are recommended you harvest with the aid of a lucrative fruit picker and peppers, allow to wait till these crops ripen before harvesting them. For sweet corn which most of us are popular with, wait till the cops fill up and the silk becomes dark then you can go ahead and harvest your crops. Mastering the art of proper gardening will enable you optimize on the crops quality and quantity all at a go. The highlighted steps will help you out in case it is your first time to try gardening. Every step is very significant and failure to observe it will make you have reduced yields or even low quality crops. It is familiar with the rules of the thumb concerning gardening and especially planting and maintenance for instance watering. This way, you will avoid common mistakes. The instructions guide that comes with the seeds’ containers should helpful in guiding you carry out proper gardening and achieve maximum results during harvesting. How to Decor Small Home in 2018 – Look Comprehensive Tips!